A memory. It’s tricky, it’s slippery, it shapeshifts as the years pass. I remember a moment from my childhood and inadvertently change its shape: recollection pushes the original moment deeper down the well. And even if I have evidence of a memory—a photograph, a video—the sensations and nuances have been lost. My “favorite aunt” lived in my family’s house when I was a little girl. (I’ll call her “Aunt Flo,” which is an inside joke we have, and based on a character in a children’s book.) When I learned to play a song on the piano—a particularly irritating one that sounded like drum circle sounds at a Native American pow-wow—she listened at eight in the morning. When she drove me home from school, she taught me how to change the gears in her car, cupping her hand over mine as we shifted, together, from first to second and second to third. (Later, she let me shift all by myself.) When I was upset, I posted a sign on my bedroom door that read, “Anger Is In This Room,” and forbid anyone from entering—except her. And when I visited her after she moved to a house down the street, she served me small glasses of milk with ice and splashes of Bailey’s Irish Cream. Her mother—my grandmother—lived in Seaside, the town next to Monterey. I have many memories of strolling in Fisherman’s Wharf. Playing on the slides at Dennis the Menace Park. Eating cotton candy on the carousel at Cannery Row. 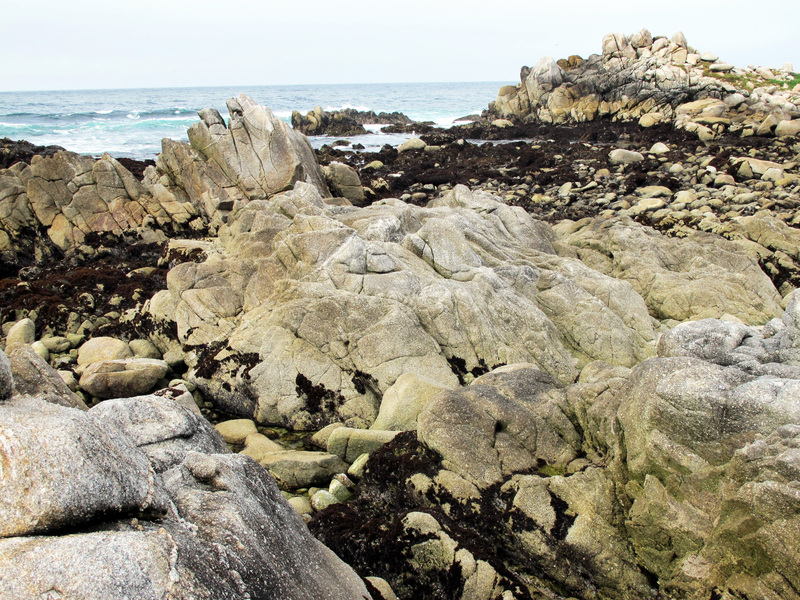 And tidepooling in Pacific Grove, from Lover’s Point to the rocky shores of Asilomar State Beach. My aunt and I designated a boulder among the tidepools as ours: a special place we could return to again and again, a spot on the beach symbolizing our relationship. Many rock formations were clustered along the water, but I was drawn to this one because part of its facade resembled a throne: I could sit down on a flat part of the stone and pretend I was a queen. We created an address for this rock: 830 Love Lane. I was 8. My aunt was 30. After this inaugural visit, we returned periodically. That is, until we could no longer find it. This weekend, I drove down to Monterey to stay with my aunt. (She relocated to the area years ago.) These days, I see her at family gatherings, but these occasions don’t give us the opportunity to really spend time together. On Sunday morning, we cruised Highway 1 toward Big Sur, just past Carmel Highlands, to trek in Sobranes Canyon. 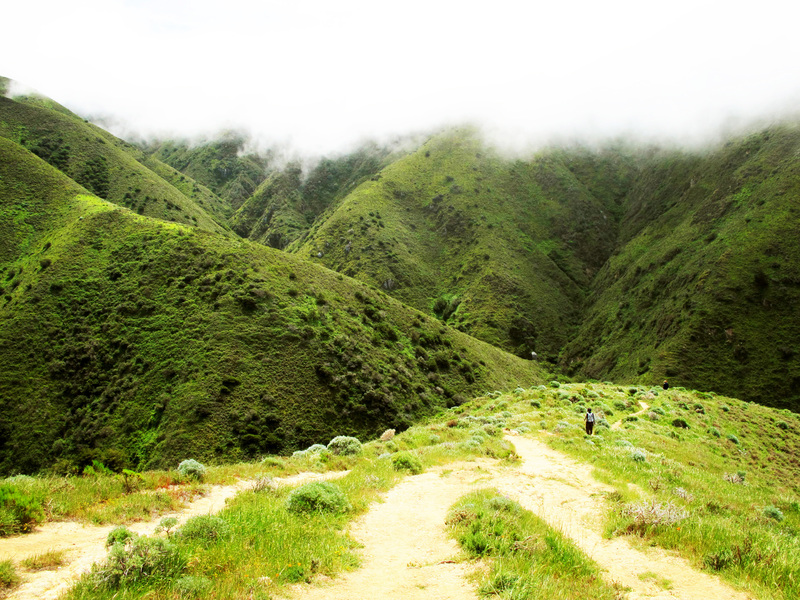 We hiked a challenging three-hour loop through the canyon, into a lush forest, and up and down a mountain. The views of the Pacific, the fog rolling in, and the Big Sur coast were spectacular. As we drove back to Monterey, achy and fatigued, she asked me what else I wanted to do. I could only think of one thing. “I’d like to find our rock,” I said. After my middle school years, I’d been unable to locate the boulder on my own. When I was in town with ex-boyfriends or friends, I’d drag them to the waterfront to hunt for it, only to fail each time. And so, we cruised the bay along Ocean View Boulevard later that day—from Lover’s Point to the golf courses of Asilomar—just as we had done when I was little. I looked out the window as she drove slowly, scanning the boulders in the distance. 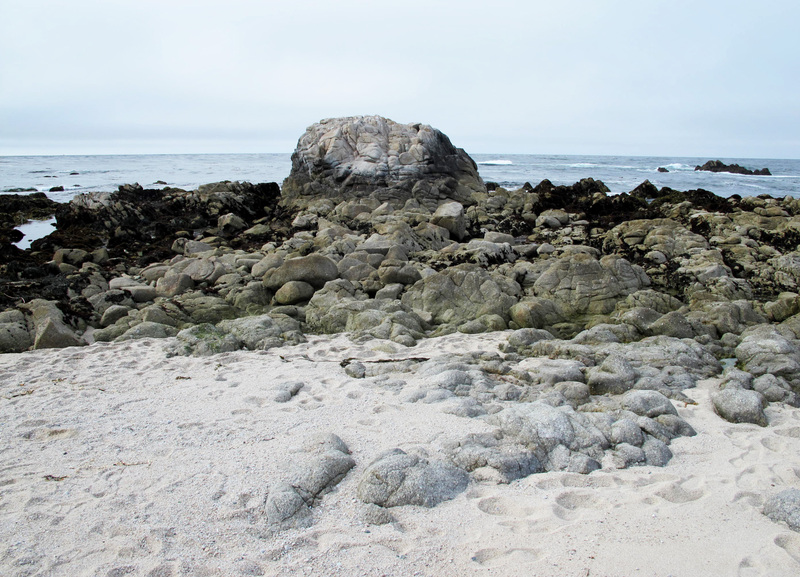 After one pass along the coast, we U-turned and studied the rocks from the opposite direction. From what I recalled, the boulder wasn’t close to the road, but further into the water, past a section of tidepools. I also remembered my throne, so was on the lookout for oddly shaped “seats” within these jagged formations. We thought we saw something, so we parked the car and went exploring to get a closer look at one rocky cluster. We stepped over pools of water, hopping from rock to rock. “I’m not quite sure I know what I’m looking for,” I said. 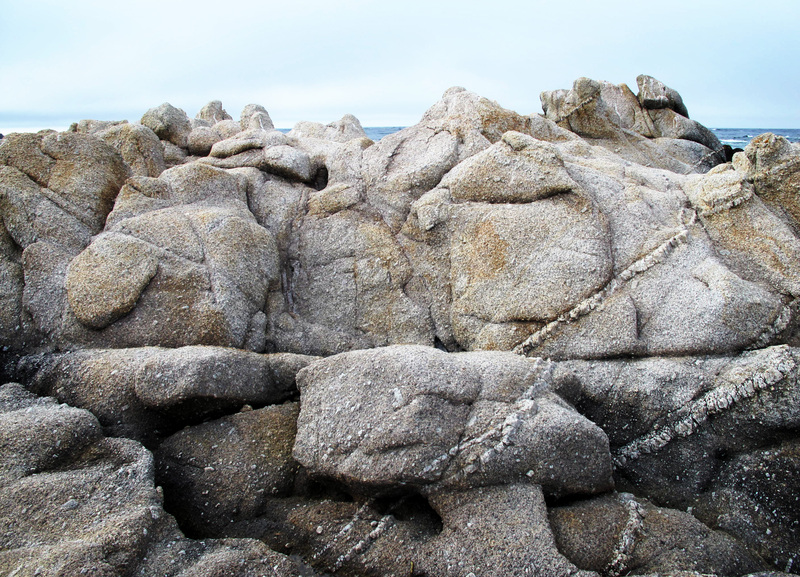 My aunt said she remembered distinct lines on our rock, like the ones pictured below. But she, too, was uncertain of what she was looking for. I gathered I’d recognize it when I saw it: The sight of this childhood throne would conjure the memory. The blurred visual skipping like a record in my mind, after more than 20 years, would freeze and sharpen. But this rock we climbed? It wasn’t the one. We continued on, combing the beach, climbing more boulders, studying the facades. None of these rocks spoke to us. Were we looking in the wrong section of the beach? Did the boulder erode after all these years? Or were we staring right at it but didn’t recognize it? We navigated around dark moss-covered rocks to climb yet another boulder that wasn’t the one. We stood atop the rock, staring at a seagull perched on the edge of what I’d thought was the “seatback” of my throne from afar. “If we don’t find it, we can baptize a new one,” my aunt said. At first, I wasn’t satisfied with this. What about the rock? The symbol of us! The marker of our past adventures! Surely we couldn’t give up so easily. 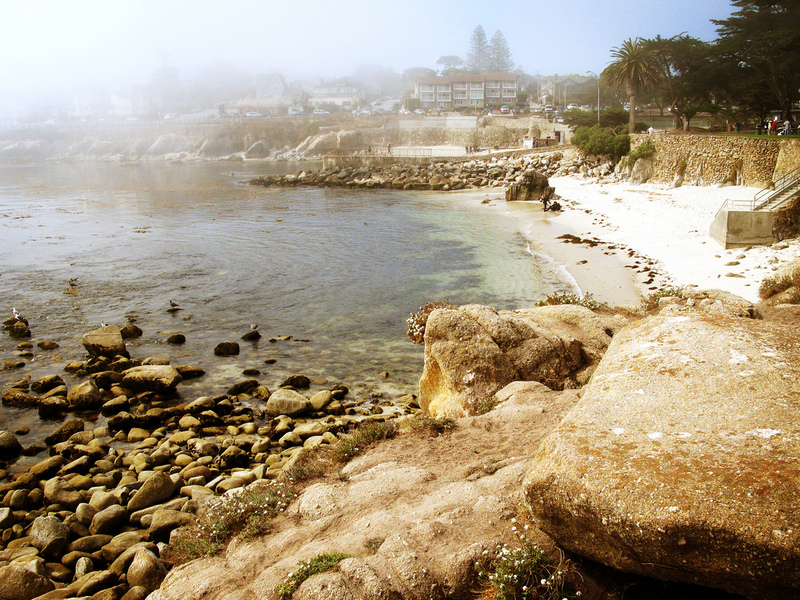 But I stared off into sea, the fog thickening over Pacific Grove. I realized I needed to let go of my 20-year search for this rock—and understand that it was okay to stop chasing the memory, to stop luring it to the surface. Because the memory’s elusiveness makes it precious. And because it was a perfect day for my aunt and me to create a new memory, and to select a new spot—just for us—for the next decades to come. And our updated address? 3153 Love Lane. 3153 Love Lane, Pacific Grove. Having lived in Monterey 40 years ago, I found your beach pictures intriguing. I climbed around on those same beaches you photographed but with an entirely different set of memories. Are you familiar with Salvadore Dali’s “Persistance of Memory”? You might find it a good analog for what you describe. Thanks for the note, Karl. Yep, I’m familiar with Dali, and that’s an interesting analogy. 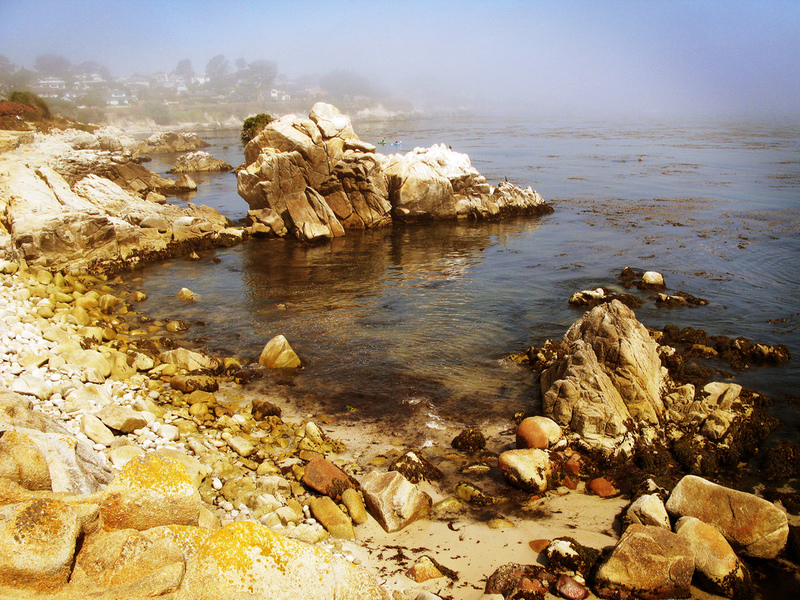 I love this coast of Monterey — glad you enjoyed the photos. Great photos. The story is touching. Thanks for reading this story about my weekend in Monterey with my aunt. Glad you enjoyed the photos, too. Now this is a gem. Beautiful writing, I’m glad I stumbled into your website. Aw, thanks for the note Christina. Appreciate it, and thanks for visiting! “Aunt Flo”: I, too, am content with our new rock. And that we were able to search together and ultimately create a new memory. After all, I am now the age you were when you first took me there. Oh, time. Wow. Nick: From what I recall, I was a pretty harmless child. I actually don’t remember writing these signs — my aunt told me I did (and she may still have them). Perhaps I could say the seeds of my gremlinesque nature were planted in these formative years? On some level I really wanted you to find the rock, to come ‘full circle’ in some way, but I’m glad you didn’t find it. It would have seemed somehow cheesy. Best left as a hazy shape in your memory. Plus you got to baptize a new home. And, “Anger Is In This Room” – really?! Can I assume you were fed after midnight as a child too? You’ve done a great job of describing the search for our rock, the former 830 Lovelane, and our herstory. One lesson that keeps haunting me still is about “letting go”. I’m grateful for the chance to have searched together with you (and diligently and persistently we did). And I am happy and content that we were able to let go and baptize a “new home” for us–it makes sense–things change, we’ve changed and the new 3153 Lovelane rock is the perfect one for us at this time. Great photos of the weekend, Cheri. This piece leaves a suspicious lump in my throat…I see memory like mercury slipping and sliding between the nooks and crannies of the actual incidences that make up our lives. It changes shape as we grow. But really, what is most important? The actual specificity of the event or the feeling that ones comes away with? I think, no, I know, that we should make new memories everyday with those we love. Congrats on the new rock.